Quite who authorised referees to take a lenient approach on black cards offence is unclear but, whatever the origin, it’s happening all the time. Warren Gatland obviously believes that it helps players if they know exactly where they stand well in advance of a game. Former Taoiseach Albert Reynolds once reflected rather ruefully that political life had a ruthless inclination to toss in nasty little surprises. "It's amazing. You cross the big hurdles and when you get to the small ones, you get tripped up," he said. It's an interesting perspective which, at times, appears to fit pretty neatly around the GAA. The organisation mostly clears high fences as confidently as a champion steeplechaser but there are occasions when, inexplicably, it does a stumbling impression of Devon Loch in the 1956 Aintree Grand National. One: The blood sub regulations and their bizarre implementation. Two: The upcoming attempt by Central Council to abolish a new rule covering the introduction of a clock-hooter to control timekeeping. Three: The failure to strike an acceptable balance so that club players aren't left idle because of inter-county activity. There's also the pressing matter of overloading young players, especially at this time of year. Over the years, there have been several examples of how idiotic the regulations surrounding the blood-sub rule are, but few can match what happened in the early minutes of last Sunday's Kerry-Mayo game. Mayo corner-forward Evan Regan crashed heavily onto the ground as he contested possession with Johnny Buckley and Mark Griffin. It became evident pretty quickly that he had sustained a nasty injury. 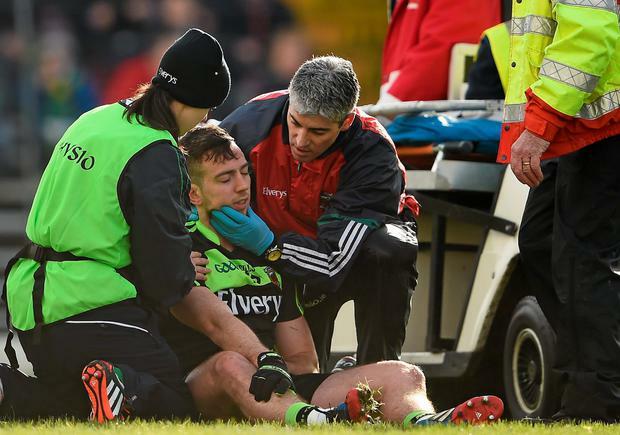 He was treated on the pitch for several minutes before being carried off and taken to hospital to be assessed for a collarbone injury and concussion. However, having suffered a cut lip in the fall, the official reason for his departure was 'blood injury'. He was replaced by Michael Conroy and, since there's no time limit for a blood sub, Mayo were deemed to have made no optional substitution until Diarmuid O'Connor arrived in the third quarter. They later filled the allowed quota of six optional substitutions but, effectively, had made seven changes. Curiously, it was all perfectly legal. The unfortunate Regan, who started well and who will, no doubt, get other chances once he recovers, had no chance of continuing, not because of a cut lip but due to two more serious issues. Yet, the cut lip trumped both for replacement purposes. It's a ridiculous implementation of a rule which was brought in for the soundest of reasons. I recall Dr Con Murphy calling for the introduction of a blood sub rule in Thurles after an incident in the 2000 Munster semi-final when Alan Browne accidentally hit Cork colleague Fergal McCormack on the head, resulting in a nasty cut. Dr Con was forced to carry out repair work on the run, with McCormack fretting to get back on so that his team weren't left short-handed. That was the norm at the time and led to Dr Con and others launching a campaign for a blood-sub rule to allow doctors treat players properly, without the team being a man down. The blood sub rule was introduced a year later. However, I doubt if the doctors envisaged the sensible measure developing into the farcical situation where there's no limit to how long a player can be off the pitch for treatment to a cut, without his replacement becoming an official sub. Nor would they have countenanced that a player who suffered some other injury could be replaced under the temporary rule if there was trickle of blood anywhere. The solution is simple: if a player who sustains a cut cannot return within 15 minutes, his replacement should become an official sub. Also, if a player clearly has an injury other than a cut, then his replacement should also be an official sub. As things stand the blood-sub rule is beyond a joke. There's something comical too about Central Council's U-turn on the introduction of a clock/hooter, as agreed by Congress in 2010 and again in 2013. Two votes? Exactly! Central Council decided after the 2010 vote that fitting the clock-hooter system in every county ground would be too expensive. Who gave them the right to overrule Congress? When it was again passed by Congress three years later, trials were conducted in third-level games in order to iron out teething difficulties. The new regulations were written into rule and the system, which has been in use in the ladies' game for quite some time, was to be in place for the start of this year's championships. However, Central Council are bringing a motion to Congress this month, proposing the deletion of the new rule, which would mean the end of the clock-hooter idea. Why so? A committee which looked into the practicalities of the system, expressed reservations. Fine, said Central Council, let's scrap it. Of course, their response should have been a terse: "Bring us solutions, not problems." After all, this was an instruction from Congress, the supreme ruling authority, not a request. As for the hardy annuals involving club fixture planning and young player overload, if everyone in the GAA agrees they are serious issues, why can't they be solved? Who or what are the malign forces that prevent it? It's not as if rival sports bodies are casting a mischievous spanner in the works. Albert Reynolds may well have been right about the little things. The GAA knows all about them. Hopefully, it was a one-off and not a sign of things to come. The scoring rate in last weekend's Allianz Football League was down considerably on the 2014 first round. The average drop across the 16-match programme was four points per game. All four sections were down on last year, with Division 4 suffering the biggest decrease, dropping an average of 7.5 points per game. The overall goal return dropped by 14 on 2014 on a weekend when 15 counties failed to score any goals. Is the difference in scoring between the two opening weekends down to the application (or should that be non-application) of the black card rule? It came into effect in January 2014, creating a wariness among players as they feared its consequences. That, inevitably, helped attackers, which boosted the scoring figures. A year on, the black card appears to be no more than an optional extra for referees. Many of the offences are ignored or turned into 'yellows', allowing the guilty party to play on. That approach helps defenders. Quite who authorised referees to take a lenient approach on black cards offence is unclear but, whatever the origin, it's happening all the time. Irrespective of the scoring rate, it was a good opening weekend for new managers, with eight of the 15 debut boys presiding over wins. Three others were involved in draws, leaving Colin Kelly (Louth), David Power (Wexford), Niall Carew (Sligo) and Johnny Magee (Wicklow) as the only newcomers on the losing side. All four will be hoping that home advantage next weekend will help get them off the mark. It's unlikely that Warren Gatland will ever be forgiven by Irish rugby supporters for leaving Brian O'Driscoll off the Lions team for the third Test against Australia in 2013 and he now risks alienating another section of the sporting community here - GAA managers. Many of them will be scandalised by his explanation of why he announced the Wales team four days in advance of Friday night's clash with England. He didn't have to show his hand until today but did so on Monday. "We decided to name the team early to give the players the best possible chance of preparation," he said. Unlike GAA managers, many of whom would be happy to make no announcements at all and line up the teams without jersey numbers, Gatland obviously believes that it helps players if they know exactly where they stand well in advance of a game. Funnily enough, some very successful GAA managers felt the same over the years but, sadly, silence for as long as possible is the new trend.